Thailand is a country situated in South Eastern Asia. There are 23 major cities in Thailand. Thai cities have excellent urban infrastructure and provide a reasonable quality of life to its residents. 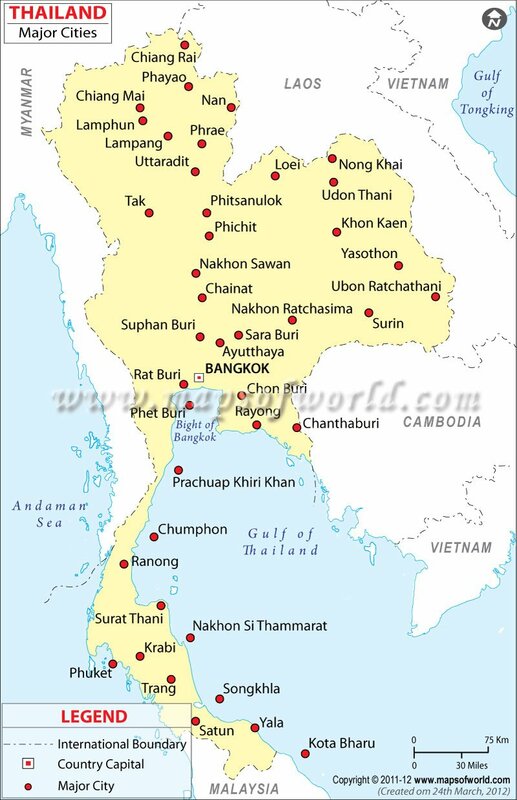 The list of major cities in Thailand includes the following urban settlements-Chiang Mai, Chiang Rai, Hat Yai, Khon Kaen, Lampang, Nakhon Pathom, Nakhon Ratchasima, Nakhon Sawan, Nakhon Si Ayutthaya, Nakhon Si Thammarat, Nonthaburi, Pak Kret, Phitsanulok, Phuket, Rayong, Samut Prakan, Songkhla,Surat Thani, Trang, Ubon Ratchathani, Udon Thani, Yala. Bangkok is the capital city of Thailand. The capital city of Bangkok is the administrative capital of Thailand. The city is located on the Chao Phraya river bank near the Gulf of Thailand. The other important Thailand cities include settlements like Chiang Mai. Chiang Mai is a city noted for its Thai cultural activities. The city is located 700 kilometers distant from Bangkok on the sides of the Ping River. Tourists come to Chiang Mai to purchase handicrafts and other locally made unique Thai products. Nakhon Pathom is a city in central Thailand. The city is known for its tattoo festival. Phuket is an island city. Phuket is one of the southern cities in Thailand. Ubon Ratchathani is a city in the Isan region of Thailand. It is the administrative center of theUbon Ratchathani province.